•Acquired by Denver from Philadelphia in a four-team, 12-player deal on August 10, 2012. •Acquired by Golden State from Denver in a sign-and-trade along with Kevin Murphy from Utah as part of a three-team deal which also sent Andris Biedrins, Richard Jefferson, Brandon Rush, a 2014 first round draft pick, a 2016 second round draft pick, a 2017 first round draft pick and a 2017 second round draft pick to Utah, as well as a 2018 second round draft pick to Denver on July 10, 2013. •Named the 2015 NBA Finals MVP with averages of 16.3 points, 5.8 rebounds, 4.0 assists and 1.33 steals in 37.1 minutes, including a 2015 postseason-high 25 points in Game 6... Joined Rick Barry (1975) as the only Finals MVPs in franchise history and became the first Finals MVP in NBA history to win the award without having started a regular season game that season. •Named an NBA All-Star in 2012. •Finalist for the 2016-17 Sixth Man of the Year Award along with Houston’s Eric Gordon and Lou Williams. •Among league leaders in 2016-17, ranked first in assist-to-turnover ratio (4.50; 261 assists to 58 turnovers), the first Warrior ever to lead the NBA in that category. •Earned NBA All-Defensive First Team honors in 2013-14, becoming the first player in Warriors history to be named First Team All-Defense since Nate Thurmond in 1970-71... Named to the NBA All-Defensive Second Team in 2010-11. •Played in all 82 regular season games five times in his career, including three consecutive seasons (2007-08 to 2009-10). •Earned MVP honors for the 2006 T-Mobile Rookie Challenge at NBA All-Star Weekend in Houston. •Finished second in the Sprite Rising Stars Slam Dunk Competition in 2006 behind New York’s Nate Robinson. •Earned NBA All-Rookie First Team honors in 2004-05. •Has tallied 81 career double-doubles and nine triple-doubles. •Won a gold medal as a member of Team USA at the 2012 Olympic Games in London. •Ranks 11th among active players in steals per game (1.59) and ranked among the top 10 in steals per game in six seasons: 2004-05 (1.68, 8th); 2006-07 (2.00, 4th); 2007-08 (2.09, 6th); 2008-09 (1.60, 10th); 2009-10 (1.72, 7th); 2011-12 (1.73, 6th)... Ranks sixth among active players in total steals (1,548) and 36th all-time. •Appeared in 976 games (759 starts) over 13 seasons with Philadelphia, Denver and Golden State, averaging 13.0 points, 5.3 rebounds, 4.5 assists and 1.59 steals in 34.7 minutes while shooting 46.5 percent from the field, 33.6 percent from three-point range and 71.4 percent from the free throw line. NBA POSTSEASON CAREER HIGHLIGHTS: •Appeared in 109 postseason games (54 starts), averaging 11.3 points, 5.0 rebounds, 4.1 assists and 1.39 steals in 33.9 minutes while shooting 44.8 percent from the field. •On the Warriors’ all-time postseason career leaders lists, ranks fourth in steals (77), fifth in three-pointers made (70), fifth in assists (247), fifth in games played (68) and seventh in minutes played (2,069). •Has scored 20-plus points 15 times in his postseason career. •Has tallied six double-doubles (four point/rebound, two point/assist), including two 20/10 games, in his postseason career. •In Game 7 of the 2016 Western Conference Finals on 5/30/16 vs. Oklahoma City, made his first start since 1/2/16 vs. Denver and first in the playoffs since Game 6 of the 2015 NBA Finals on 6/16/15... Scored seven points and grabbed four rebounds in 43 minutes in the Warriors’ win, his most minutes played in a postseason game as a Warrior (most since Game 2 of the 2013 First Round with Denver on 4/23/13 vs. Golden State). •Started each of the last three games of the 2015 NBA Finals and helped lead Golden State to three-straight victories to close out The Finals. •Blocked a playoff career-high three shots in Game 4 of the 2015 Western Conference Finals on 5/25/15 at Houston. •Tallied 18 points, eight rebounds and eight assists in Game 5 of the 2014 First Round on 4/29/14 at the L.A. Clippers, becoming the first Warrior to tally those numbers in a playoff game since Baron Davis in Game 1 of the First Round on 4/22/07 at Dallas. •In 2013 with Denver, joined LeBron James and Kevin Durant as the only players to average at least 18.0 points, 8.0 rebounds and 5.0 assists in the postseason. •Won his first playoff series in the 2012 First Round with Philadelphia, as the No. 8 seed 76ers defeated the No. 1 seed Chicago Bulls with a 4-2 series victory. •Hit two series-clinching free throws with 2.2 seconds remaining in Philadelphia’s 79-78 win in Game 6 of the 2012 First Round on 5/10/12 vs. Chicago... Finished the game with 20 points, seven assists and four rebounds in 43 minutes. •Scored a postseason career-high 29 points in Game 3 of the 2009 First Round on 4/24/09 vs. Orlando. •Made his NBA playoff debut in Game 1 of the 2005 First Round on 4/23/05 at Detroit, tallying 10 points, four rebounds, four assists and two steals in 40 minutes. 2016-17 HIGHLIGHTS WITH GOLDEN STATE: •Appeared in 76 games, averaging 7.6 points, 4.0 rebounds, 3.4 assists and 1.00 steal in 26.3 minutes per game while shooting a career-high 52.8 percent from the field. •Named a finalist for the 2016-17 Sixth Man of the Year Award along with Houston’s Eric Gordon and Lou Williams. •Among league leaders, ranked first in assist-to-turnover ratio (4.50; 261 assists to 58 turnovers), the first Warrior ever to lead the NBA in that category. •Ranked first among all reserves (min. 50 games) in plus/minus per game with an on-court differential of +6.9. •Tallied a single-season career-best 36 games without a turnover. •Scored in double figures 22 times and 20-plus three times... Scored in double figures four-straight times, a season-best streak (3/26-3/31). •Scored 15 points on a season-high-tying seven field goals (7-of-10 FG) on 4/8 vs. New Orleans... Recorded five assists without a turnover in that contest. •Averaged 12.0 points, 4.3 rebounds and 3.4 assists while shooting 59.4 percent from the field and 41.0 percent from three-point range in the month of March. •Recorded 14 points, his season-best fourth-straight game in double figures, to go with five rebounds and five assists on 3/31 vs. Houston. •Scored 14 points in 30 minutes off the bench, his third-straight double-digit scoring effort, on 3/29 at San Antonio. •Tallied 12 points in 31 minutes off the bench, his second-straight double-digit scoring game, on 3/28 at Houston. •Scored 20 points to go with seven rebounds and four assists, his third 20-point game of the season, on 3/26 vs. Memphis... Warriors improved to 12-0 all-time in the regular season when he scores 20 points. •Scored a season-high 24 points on 3/6 at Atlanta, his second 20-point outing of the season, connecting on a season-high four three-pointers (4-of-6 3FG) and a season-high-tying eight free throws (8-of-11 FT). •Dished out a season-high nine assists on 2/25 vs. Brooklyn. •Appeared in his 250th regular-season game with the Warriors on his 33rd birthday on 1/28 vs. the L.A. Clippers, recording his 5,000th career rebound in the game. •Scored 14 points on a perfect 5-of-5 from the field (2-of-2 from three) on 1/16 vs. Cleveland, tied for the most field goals he has made without a miss in a game in his career. •Recorded 17 assists and no turnovers in a five-game stretch (1/4-1/12), the longest streak of games without a turnover in his career. •Dished out six assists without a turnover on 1/4 vs. Portland, a season-high for most assists without a turnover. •Missed five games due to rest (12/10, 1/23, 3/11, 4/5, 4/12)... Missed one game with a left hip strain (3/21). 2017 POSTSEASON HIGHLIGHTS WITH GOLDEN STATE: •Appeared in 16 games, averaging 7.2 points, 4.1 rebounds and 3.2 assists in 26.2 minutes while shooting 45.5 percent from the field. •Scored in double figures four times, including one 20-point game. •Among league leaders, ranked sixth in the 2017 postseason in assist-to-turnover ratio (3.19; 51 assists to 16 turnovers). •Scored a 2017 postseason-high 20 points in 38 minutes off the bench in Game 5 of the NBA Finals on 6/12 vs. Cleveland, recording his fourth double-digit scoring effort of the 2017 postseason and finishing with a game-high-tying +18 on-court differential... Set a 2017 playoff-high with four steals and tied a 2017 postseason-high with two three-pointers. •Appeared in his 100th career postseason game (59th with the Warriors) in Game 3 of the Western Conference Semifinals on 5/6 at Utah, leading all reserves with 11 points, his second-straight double-digit scoring effort (third of the 2017 postseason). •Scored 10 points to go with five rebounds and four assists in Game 2 of the Western Conference Semifinals on 5/4 vs. Utah, scoring in double figures for the second time of the 2017 postseason. •Finished the First Round series with an assist-to-turnover ratio of 9.00 (18 assists to two turnovers). •Led all reserves with 16 points in Game 3 of the First Round on 4/22 at Portland. •Grabbed 10 rebounds in Game 2 of the First Round on 4/19 vs. Portland, recording his sixth career double-digit rebound performance in the playoffs (second with the Warriors)... Dished out six assists without a turnover in that contest. •Missed Game 2 of the Western Conference Finals on 5/16 vs. San Antonio due to left knee soreness. 2015-16 HIGHLIGHTS WITH GOLDEN STATE: •Appeared in 65 games (one start), averaging 7.0 points, 4.0 rebounds, 3.4 assists and 1.12 steals in 26.6 minutes. •Scored in double figures 17 times and 20-plus three times. •Returned from a 13-game absence due to a left ankle sprain on 4/5 vs. Minnesota. •Hit two game-tying free throws with 0.7 seconds remaining to force overtime on 2/27 at Oklahoma City, a game the Warriors went on to win. •Matched his season high with 20 points on 1/18 at Cleveland, hitting a season-high 7-of-8 (.875) from the field and matching a season-best with four threes (4-of-5 3FG). •On 1/2 vs. Denver, made his first regular-season start since 4/13/14 at Portland (first overall since Game 6 of the NBA Finals on 6/16/15 at Cleveland), tallying nine points and six assists in 43 minutes. •Tied a season-high with 20 points on 12/31 at Houston, hitting a season-high six free throws (6-of-7 FT). •Recorded his lone double-double of the season with 13 points and a season-high 10 rebounds on 12/11 at Boston. •Tallied season-highs in points (20) and three-pointers (4) on 11/11 at Memphis. •Dished out a season-high seven assists on 11/6 vs. Denver. •Missed 13 games due to a left ankle sprain... Missed three games due to left hamstring tightness... Missed one game due to rest. 2016 POSTSEASON HIGHLIGHTS WITH GOLDEN STATE: •Appeared in 24 postseason games (three starts), averaging 8.9 points, 4.4 rebounds, 3.8 assists and 1.21 steals in 32.0 minutes. •Scored in double figures eight times and 20-plus once. •In his third start of the postseason in Game 6 of the NBA Finals on 6/16 at Cleveland, tallied five points, four rebounds and three assists in 30 minutes. •Earned his second start of the postseason in Game 5 of the NBA Finals on 6/13 vs. Cleveland, finishing with 15 points, a 2016 postseason-high 11 rebounds and six assists for his sixth career postseason double-double (first with the Warriors). •In Game 7 of the Western Conference Finals on 5/30 vs. Oklahoma City, made his first start since 1/2/16 vs. Denver and first in the playoffs since Game 6 of the 2015 NBA Finals on 6/16/15... Scored seven points and grabbed four rebounds in 43 minutes, his most minutes played in a postseason game as a Warrior (most since 4/23/13 vs. Golden State, Game 2 of the First Round). •Dished out a 2016 postseason-high eight assists to go with eight points in Game 5 of the Western Conference Finals on 5/26 vs. Oklahoma City. •Scored a 2016 postseason-high 22 points in Game 4 of the First Round on 4/24 at Houston, his 14th career playoff 20-point game (fourth with Golden State; first as a reserve). 2014-15 HIGHLIGHTS WITH GOLDEN STATE: •Appeared in 77 games, all off the bench, averaging 7.8 points, 3.3 rebounds and 3.0 assists in 26.9 minutes. •Among reserves (min. 40 games off the bench), led the NBA in plus/minus (+5.7) and Net Rating (12.2). •Scored in double figures 21 times and 20-plus three times. •Matched a season-high with four three-pointers on 4/4 at Dallas. •Hit a season-high six free throws (6-of-9 FT) on 3/31 at the L.A. Clippers, matching a season-high with seven assists. •Scored in double figures five consecutive times (3/18-3/24), his longest such streak as a Warrior... Averaged 15.2 points on 65.9 percent shooting from the field in that span. •Tied season-highs with 21 points and nine field goals (9-of-11 FG) on 3/24 at Portland. •Scored a season-high 21 points and hit a season-high nine field goals (9-of-11 FG), including a perfect 7-of-7 from inside the arc, on 3/18 vs. Atlanta. •Hit a season-high four three-pointers to finish with 14 points and six rebounds on 2/20 vs. San Antonio. •Dished out a season-high seven assists on 1/14 vs. Miami. •Scored 20 points on 7-of-12 (.583) shooting from the field and collected five rebounds on 12/14 at New Orleans. •In his 759th regular-season game (807th including playoffs), came off the bench for the first time in his career in the season opener on 10/29 at Sacramento. •Missed five games due to rest. 2015 POSTSEASON HIGHLIGHTS WITH GOLDEN STATE: •Appeared in 21 postseason games (three starts), averaging 10.4 points, 4.5 rebounds, 3.6 assists and 1.19 steals in 30.2 minutes. •Named the NBA Finals MVP with averages of 16.3 points, 5.8 rebounds, 4.0 assists and 1.33 steals in 37.1 minutes, including a 2015 postseason-high 25 points in Game 6... Joined Rick Barry (1975) as the only Finals MVPs in franchise history and became the first Finals MVP in NBA history to win the award without having started a regular season game that season. •In his 96th game of the season, made his first start of the year in Game 4 of the NBA Finals on 6/11 at Cleveland with Golden State trailing 1-2 in the series, and finished with 22 points and eight rebounds, matching a season-high with four threes. •Started each of the last three games of NBA Finals and helped lead Golden State to three-straight victories to close out The Finals. •Blocked a playoff career-high three shots in Game 4 of the Western Conference Finals on 5/25 at Houston. •In the last three games of the Western Conference Semifinals against Memphis (all Warriors wins), shot 8-of-14 (.571) from three-point range. 2013-14 HIGHLIGHTS WITH GOLDEN STATE: •Appeared in 63 games (all starts), averaging 9.3 points, 4.7 rebounds, 4.2 assists and 1.51 steals in 32.4 minutes. •Earned NBA All-Defensive First Team honors, the first All-Defensive Team selection for a Warrior since Latrell Sprewell was named to the Second Team in 1993-94 and the first time a Warrior was named to the First Team since Nate Thurmond in 1970-71... Marked his second career All-Defensive recognition (previously named to the Second Team with Philadelphia in 2010-11). •Led the NBA in plus/minus per game, averaging a +9.0 point differential while on the court. •Scored in double figures 24 times, 20-plus three times and 30-plus once. •Tallied double-digit assists four times and double-digit rebounds twice. •Hit 9-of-10 (.900) at the free throw line on 3/30 vs. New York, the first time he’s hit at least 90 percent of his free throws (minimum 10 attempts) since 2/9/09 vs. Phoenix (10-of-11 FT). •Grabbed a season-high 11 rebounds on 2/22 vs. Brooklyn. •Secured a double-double with 12 points and 10 rebounds on 1/26 vs. Portland. •Hit his second buzzer beater of the season (fifth career game-winner) on a three-pointer as time expired on 1/3 at Atlanta. •Totaled eight points, 10 assists and seven rebounds on 12/29 at Cleveland. •Dished out a season-high 14 assists on 11/20 vs. Memphis. •Hit the game-winner as time expired on 11/14 vs. Oklahoma City, his fourth career game-winner with less than three seconds remaining... Finished the game with 14 points and nine assists. •Scored a season-high 32 points on 11/4 at Philadelphia, hitting 11-of-18 (.611) from the field and a career-high seven threes (7-of-11 3FG). •Recorded his first double-double as a Warrior on 10/31 at the L.A. Clippers, totaling 14 points and 11 assists. •Made his Warriors debut on 10/30 vs. the L.A. Lakers, totaling seven points, four rebounds, four assists and two steals. •Missed 12 games with a left hamstring strain... Missed six games with right knee tendinitis... Missed one game due to rest. 2014 POSTSEASON HIGHLIGHTS WITH GOLDEN STATE: •Appeared in seven postseason games (all starts), averaging 13.1 points, 4.7 rebounds, 4.4 assists and 1.29 steals in 35.4 minutes, tallying postseason career-highs with 51.6 percent shooting from the field and 53.3 percent from three-point range. •Scored in double figures in five-straight games to end the postseason, his longest double-digit scoring streak of the season. •Tallied 18 points, eight rebounds and eight assists in Game 5 of the First Round on 4/29 at the L.A. Clippers, becoming the first Warrior to tally those numbers in a playoff game since Baron Davis in Game 1 of the First Round on 4/22/07 at Dallas. •Finished with playoff season-highs in points (22) and assists (nine) while shooting 6-of-8 (.750) from the field, 2-of-2 from three-point range and 8-of-10 (.800) from the free throw line in 42 minutes in Game 4 of the First Round on 4/27 vs. the L.A. Clippers. 2012-13 HIGHLIGHTS WITH DENVER: •Appeared in 80 games (all starts), averaging 13.0 points, 5.4 assists, 5.3 rebounds and 1.74 steals in 34.7 minutes. •Ranked 11th in the NBA in steals per game and third among shooting guards in assists per game behind only Kobe Bryant (6.0) and James Harden (5.8). •Scored 20-plus points 11 times. •Totaled 10 double-doubles and one triple-double. •Scored a season-high 29 points twice (11/23 vs. Golden State; 2/27 at Portland). •Recorded a triple-double on 4/10 vs. San Antonio with 12 points,13 rebounds and 10 assists. 2013 POSTSEASON HIGHLIGHTS WITH DENVER: •Appeared in six postseason games (all starts) in Denver’s first round playoff series against Golden State, averaging 18.0 points, 8.0 rebounds, 5.3 assists and 2.00 steals in 40.5 minutes. •Joined LeBron James and Kevin Durant as the only players to average at least 18.0 points, 8.0 rebounds and 5.0 assists during the 2013 NBA Playoffs. •Led the team in the postseason in assists, steals and minutes, while ranking second in points and rebounds. 2011-12 HIGHLIGHTS WITH PHILADELPHIA: •Appeared in 62 games (all starts), averaging 12.4 points, 6.1 rebounds, 5.5 assists and 1.73 steals in 35.6 minutes, shooting a career-high 39.4 percent from three-point range. •Totaled eight double-doubles and one triple-double. •Recorded a triple-double on 1/28 vs. Detroit with 10 points, 10 rebounds and 10 assists in 35 minutes. 2012 POSTSEASON HIGHLIGHTS WITH PHILADELPHIA: •Appeared in 13 postseason games (all starts), averaging 12.9 points, 5.7 rebounds, 3.7 assists and 1.46 steals in 38.8 minutes. •Won his first playoff series, as the No.8 seed Sixers defeated the No. 1 seed Chicago Bulls (4-2) in the First Round. •Hit two series-clinching free throws with 2.2 seconds remaining in Philadelphia’s 79-78 win in Game 6 of the First Round on 5/10 vs. Chicago... Finished the game with 20 points, seven assists and four rebounds in 43 minutes. 2010-11 HIGHLIGHTS WITH PHILADELPHIA: •Appeared in 67 games (all starts), averaging 14.1 points, 6.3 assists, 5.8 rebounds and 1.51 steals in 36.9 minutes per game. •Named to the NBA All-Defensive Second Team, his first career All-Defensive honor. •Joined LeBron James as the only players in the NBA to average at least 14 points, six assists and five rebounds in 2010-11. •Tallied 11 double-doubles and three triple-doubles. •One of four players (LeBron James, Rajon Rondo and Russell Westbrook) to notch at least three triple-doubles in 2010-11. •Saw his streak of 252 consecutive games played/started end on 11/7 at New York because of tendinitis in his right Achilles and missed 15 games overall. •Dished out a career-high 16 assists and scored 18 points on 2/4 vs. New York. 2011 POSTSEASON HIGHLIGHTS WITH PHILADELPHIA: •Appeared in all five postseason games (all starts) of the First Round against Miami, averaging 11.4 points, 7.0 rebounds, 6.8 assists and 1.00 steal in 36.4 minutes per game. •Scored a postseason-high 22 points and grabbed 10 rebounds in 35 minutes in Game 5 of the First Round on 4/27 at Miami. 2009-10 HIGHLIGHTS WITH PHILADELPHIA: •Started all 82 games for the third-straight season, averaging team-highs in points (17.1), assists (5.8) and steals (1.72) to go with 6.5 rebounds in 38.9 minutes. •Ranked tied for 14th in the league in assists, seventh in steals and second in total minutes played. •Joined LeBron James as the only players to average at least 17 points, six rebounds and five assists in 2009-10. •Scored 20-plus points 29 times and 30-plus four times. •Recorded 11 double-doubles (seven point/rebound, four point/assist). •Scored a season-high 33 points to go with 11 assists, eight rebounds and five steals on 4/3 vs. Toronto. •Grabbed a career-high 17 rebounds and scored 14 points on 3/15 vs. New York. 2008-09 HIGHLIGHTS WITH PHILADELPHIA: •Started all 82 games for the second-straight season, averaging a team-high 18.8 points to go with 5.7 rebounds, 5.3 assists and 1.60 steals in 39.9 minutes. •Joined LeBron James, Chris Paul and Dwyane Wade as the only players among qualifiers to average at least 18 points, five rebounds and five assists in 2008-09. •Led the NBA in total minutes played and minutes per game (3,269) while ranking 27th in scoring, 21st in assists, 10th in steals and 12th in free throw attempts. •Averaged 20.6 points over the final 64 games of the season after averaging 13.0 through the first 17 games. •Posted 11 double-doubles (six point/rebound, five point/assist). •Hit a career-high 14 free throws (14-of-17 FT) on 12/31 at the L.A. Clippers, finishing with 28 points, seven rebounds and seven assists. 2009 POSTSEASON HIGHLIGHTS WITH PHILADELPHIA: •Started all six games of Philadelphia’s First Round matchup vs. Orlando, averaging team-highs of 21.5 points, 6.7 assists and 1.83 steals along with a team-high-tying 6.3 rebounds in 44.8 minutes per game. 2007-08 HIGHLIGHTS WITH PHILADELPHIA: •Started all 82 games, averaging a career-high 19.9 points to go with 5.4 rebounds, 4.8 assists and 2.09 steals in 39.5 minutes per game. •Joined Caron Butler as the only players among qualifiers to average at least 19 points, five rebounds, four assists and two steals in 2007-08. •Ranked sixth in the NBA in steals, tied for 28th in scoring, tied for 26th in assists and sixth in minutes played. •Over the season’s final 66 games, had 140 steals to 147 turnovers (steals per turnover ratio of 0.95). •Scored 20-plus points a career-high 43 times, with Philadelphia posting a 25-18 record when he scored at least 20 points, and scored 30-plus four times. •Collected eight double-doubles (five point/rebound, three point/assist). •Tallied 30 points and 10 assists on 4/4 at Atlanta, becoming the first Sixer to post a 30-point/10-assist game since Allen Iverson on 12/2/06 and the first Sixer other than Iverson to do so since Jeff Hornacek on 11/20/92. •Scored a season-high 33 points to go with six rebounds, five assists and two blocks in 40 minutes on 1/26 at Charlotte. 2008 POSTSEASON HIGHLIGHTS WITH PHILADELPHIA: •Started all six games of Philadelphia’s First Round playoff series against Detroit, averaging 13.2 points, 5.0 assists, 4.8 rebounds and 2.17 steals in 39.0 minutes per game. 2006-07 HIGHLIGHTS WITH PHILADELPHIA: •Appeared in 76 games (all starts), averaging 18.2 points, 5.7 rebounds, 5.7 assists and 2.00 steals in a career-high 40.3 minutes per game. •One of just four players among qualifiers to average at least 18 points, five rebounds and five assists in 2006-07 (Kobe Bryant, LeBron James and Tracy McGrady). •Over his final 29 games played, averaged 20.0 points, 6.7 assists and 6.1 rebounds in 41.4 minutes. •Ranked 29th in the league in scoring, tied for 16th in assists, fourth in steals and tied for fourth in minutes per game. •Tallied seven double-doubles and three triple-doubles, one of just three players (Jason Kidd and Kevin Garnett) to record at least three triple-doubles in 2006-07. •Scored a career-high 34 points and dished out nine assists on 1/24 at Cleveland. •Missed the first game of his career with a lower back strain on 3/23 and missed five more games with that injury... At the time, his streak of 232 consecutive games started was the third longest of any active player in the NBA. 2005-06 HIGHLIGHTS WITH PHILADELPHIA: •Started in all 82 games, averaging 12.3 points, 5.9 rebounds, 3.1 assists and 1.65 steals in 37.6 minutes per game. •Became the first Sixers player since Clarence Weatherspoon (1992-94) to start and play in all 82 games of his first two seasons with the team. •Ranked 14th in the NBA in steals per game and 12th in steals per turnover ratio (0.88). •Scored in double figures 55 times and 20-plus 10 times. •Tallied a season-high 27 points to go with eight assists and five rebounds on 4/18 vs. New Jersey. •Matched a career-high with six steals to go with 13 points and six assists on 2/24 at Milwaukee. •Swiped a career-high-tying six steals and scored 20 points on 12/9 vs. Charlotte. •Named MVP of the 2006 T-Mobile Rookie Challenge at NBA All-Star Weekend in Houston, tallying 30 points, six rebounds, four steals and three assists for the Sophomores squad. •Finished second in the Sprite Rising Stars Slam Dunk Competition, edged by New York’s Nate Robinson in the NBA’s first-ever dunk contest tie-breaker. 2004-05 HIGHLIGHTS WITH PHILADELPHIA: •Started all 82 games, averaging 9.0 points, 5.7 rebounds, 3.0 assists and 1.68 steals in 32.8 minutes per game... Was the only Sixer to start every game and the first Sixers rookie to start 82 games in a season since Clarence Weatherspoon (1992-93). •Named to the NBA All-Rookie First Team. •Among NBA leaders, ranked eighth in steals per game. •Finished with 138 steals, the third-most steals by a Sixers rookie in franchise history. •Tallied five double-doubles and one triple-double. •Recorded his first career triple-double with 10 points, 10 rebounds and 10 assists on 3/23 vs. Detroit. •Tied his season-high with 22 points on 1/10 vs. Portland. •Posted his first career double-double on 12/28 at Portland, tallying a season-high 22 points and 10 rebounds. •Swiped a career-high six steals to go with eight points and 11 rebounds on 11/21 at Miami. •Made his NBA debut on 11/3 at Boston, recording eight points, one assist and one steal in 20 minutes. •Tallied 11 points, seven rebounds and four assists in the got milk? Rookie Challenge at NBA All-Star Weekend in Denver. 2005 POSTSEASON HIGHLIGHTS WITH PHILADELPHIA: •Started all five games in Philadelphia’s First Round playoff series against Detroit, averaging 9.8 points, 4.6 rebounds, 3.0 assists and 2.80 steals in 38.4 minutes. •Made his NBA playoff debut in Game 1 of the First Round on 4/23 at Detroit, tallying 10 points, four rebounds, four assists and two steals in 40 minutes. USA BASKETBALL HIGHLIGHTS: •Named a member of the 2014 USA Basketball Men’s National Team player pool but had to withdraw from consideration for the 2014 World Cup due to injury. •Won an Olympic gold medal with the U.S. Men’s Basketball Team at the 2012 Olympic Games in London, averaging 4.3 points, 2.8 rebounds and 1.4 assists while shooting 70.0 percent from the field in Olympic play. •Started for Team USA at the 2010 FIBA World Championship in Turkey, averaging 5.7 points, 4.6 rebounds and 1.9 assists in nine games as Team USA captured gold. •Member of the U.S. Select Team in 2008, which prepared Team USA for the Olympic Games. COLLEGIATE HIGHLIGHTS WITH ARIZONA: •Appeared in 62 games (34 starts) over two seasons at Arizona, averaging 9.6 points, 6.6 rebounds, 3.4 assists and 1.53 steals in 25.4 minutes. •In his final season at Arizona as a sophomore in 2003-04, named to the All-Pac-10 Team, earned All-District 9 honors from the U.S. Basketball Writers Association, named Honorable Mention All-America by The Associated Press and received Second Team Pac-10 All-Academic honors. •Became the sixth early entry candidate under Arizona head coach Lute Olson. •Posted 10 career double-doubles and three triple-doubles. •Joined Jason Kidd (California) as the only Pac-10 players to register more than one triple-double in a season. •Named to the Pac-10 All-Freshman team in 2002-03. •Appeared in five NCAA Tournament games. •Signed with Arizona in the spring of 2002 after being released from his National Letter of Intent at Arkansas following Nolan Richardson’s departure. 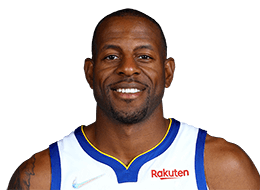 PERSONAL: Full name is Andre Tyler Iguodala (ig-uh-DAH-luh)... Son of Linda Shanklin... Married his wife, Christina, in August 2015 in Cabo... Has a son, Andre Tyler II... Brother Frank played basketball at Lake Land College (Mattoon, IL. ; 2000-02), and the University of Dayton (2002-04)... During the summer of 2001, named the AAU national tournament Most Valuable Player after hitting the game-winning shot at the final buzzer to give his team the 17-and-under national title... Also earned three letters in track and field in high school... Majored in education at Arizona... Has an interest in technology and cites post-playing career opportunities in the Bay Area as one of the factors in choosing to sign with Golden State in 2013... Together with Stephen Curry, led the inaugural Players Technology Summit, presented by Bloomberg, in August 2017 in San Francisco, which brought together top leaders in the technology, venture capital and sports communities to exchange ideas and share expertise... Led the inaugural NBPA Tech Summit in San Francisco in July 2016, which helped provide current and former NBA players with educational content and presentations from executives of major media and technology companies, site visits to several media and technology companies in Silicon Valley, networking opportunities with senior executives and influencers, and workshops designed to identify opportunities for players to pursue both during and after their NBA careers... Spoke at TechCrunch Disrupt San Francisco in September 2015, discussing his life of basketball and business as well as his passion for the tech industry... Was an investor and served as the Men’s Style Director for Twice, an online clothing retailer... Awarded the key to the city of his hometown, Springfield, IL, when he returned to his alma mater, Lanphier High School, with the Larry O’Brien Championship Trophy in August 2015... Joined by his basketball coaches over the years, as well as the school’s current team and local dignitaries, at the ceremony... Traveled to Japan as part of the NBA Clutch Time Trophy Tour during the summer of 2015... Hobbies include golf, reading and video games... Has been active in Warriors community outreach efforts... Made a visit to Oakland Children’s Hospital prior to the start of the 2013-14 season... As part of the Warriors’ Plays for the Holidays initiative and NBA Cares Season of Giving, he and his family hosted a movie night for youth from the Boys & Girls Clubs of Oakland... Hosted Andre’s Book Drive in 2006 and 2007, leading to the donation of more than 2,600 new children’s books to Philadelphia READS... In 2004-05, hosted a Caps for Kids Drive, which brought in over 1,400 new hats that were donated to local children’s hospitals... Established the Andre Iguodala Disaster Relief Fund in March 2006 to raise money to assist tornado victims in his hometown of Springfield... Interacts with fans and keeps them updated on his activities on his personal website, www.mindofai9.com... An avid golfer, played in the Frys.com Open Pro-Am in Napa prior to the PGA Tour’s season-opening event in October of 2015 and the Ellie Mae Classic Pro-Am at TPC Stonebrae in July 2016... Is a big fan of the San Francisco 49ers... Took over the @49ers account in the 2013 preseason and sounded the ceremonial foghorn in an on-field ceremony before a 49ers game in October of 2015.